Maybe you’re not a giant fan of the galvanized look—maybe silver isn’t your metal. If that’s the case, you may think that chain link is out, even if you love its durability and strength. We hate to burst your bubble, but you’d be wrong. Vinyl coated chain link fences are the best of both worlds—the strength of galvanized with the polished appearance of designer vinyl colors. One of our recent vinyl fence projects was for an Embree Group property in Dripping Springs, Texas. The Embree Group specializes in build-to-suit construction, among other things, for specialty retail, medical, financial, automotive, and restaurant facilities. The property featured several ponds, one retention pond and one detention pond, which could have posed quite a hazard to passersby. Understandably, they wanted a quality fence product that withstand the elements and would provide sturdy, long-lasting protection. They decided on a four-foot tall black vinyl coated chain link fence, which provided the protection they were looking for and a stylish alternative to the traditional galvanized fence. With their focus on specialty construction, Embree Group wanted something attractive and functional—and we were able to provide that for them. Most people believe that the choice of a chain link fence means the choice of no privacy. Austin Capital Concrete decided to harness the strength of a galvanized chain link fence with the privacy of a solid fence. With the addition of a 90% occupancy green screen, our client had both the durability and privacy for their large property. 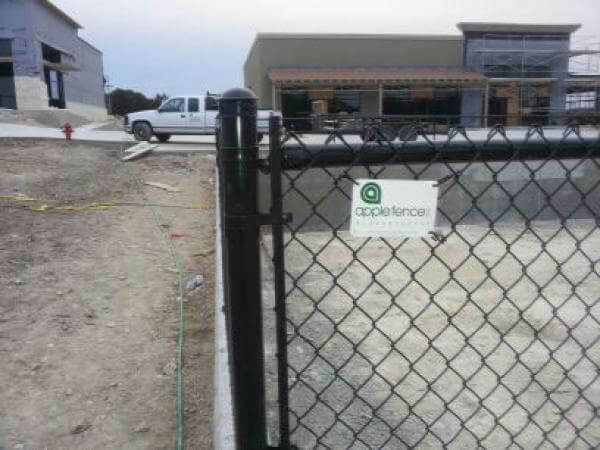 Whatever your needs, whether that is an attractive alternative to the standard galvanized chain link or a fence that provides both chain link strength along with the privacy of a solid fence, Apple Fence Company has a decade of experience helping customers solve complex problems with simple, straightforward solutions.